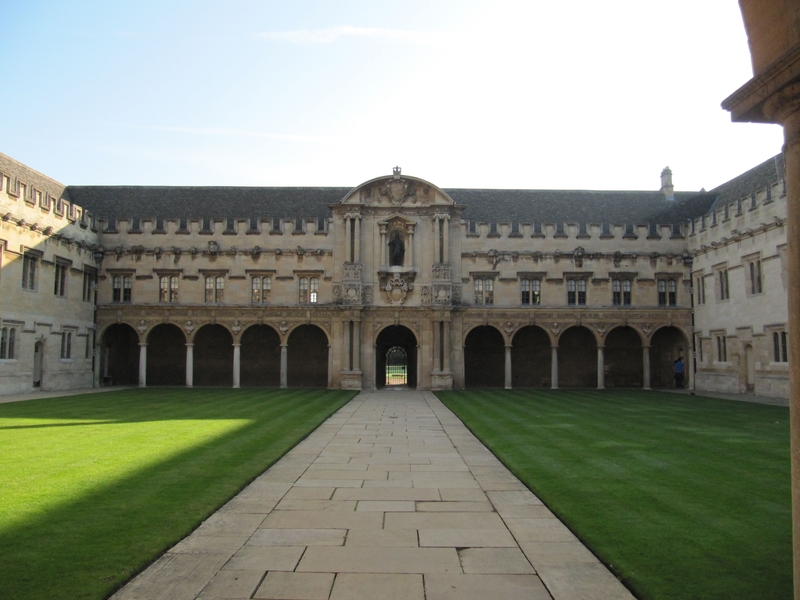 First post: Oxford is a series of contradictions- both ancient and modern, charming and exasperating, intimate and aloof, egalitarian and hierarchical. The system of exams and tutorials dates back centuries and yet Oxford is in the grips of the modern higher education funding crisis. The slow-paced lifestyle of a small town is charming and yet the amorphous and ill-defined bureaucracy of the university leaves you wondering what is expected of you, much less who to ask. The college system creates small, intimate communities where you see the same people at meals and wave while you walk through the quads on your way to the library or your room but this can also make you feel disconnected from the rest of the university. And while the system of academic advisors provides a unique level of access to professors, the university is overtly hierarchical as epitomized by the “high table” where the faculty sit during meals. The amazing talks and lectures hosted every day at Oxford are enough to keep my calendar full, but the English seem to eat a disproportionately large amount of potatoes and mayonnaise and a dearth of fresh vegetables, so I figured that some physical activities were in order. I joined the water polo club at Oxford and after playing competitively at UC Irvine, adapting to the laid back and recreational atmosphere has been an adjustment, but I am eager to see the team improve and the Cambridge match will be a great way to take part in one of the world’s oldest sports rivalries. Rowing is also a quintessential English experience and one that I couldn’t pass up. Even at the novice level it is clear that this is a sport that fetishizes pain- the early morning practices on the frigid river, blisters all over the hands and agonizing sprint sessions on the erg machine are all part of its weekly charms. This week my boat finally got to the point where we could get all eight people rowing at a time and that has been a comedy of errors- people get out of synch on the strokes, then the boats starts rocking violently and eventually someone’s oar loses traction with the water and the handle comes sailing towards their head. And they say rowing isn’t a contact sport! The other highlight thus far has been the Rhodes community. Rhodes scholars are a dime a dozen at Oxford. There are approximately 200 of us in residence here at any given time and several thousand have passed through these halls in the last century so no one is automatically awed by our brilliance or taken aback by our curriculum vitas. But on the whole, I can’t say enough about how much I have enjoyed getting to know the other scholars. They are a truly exceptional group of people. And it has nothing to do with overt displays of intelligence. Everyone is incredibly understated but has a fascinating life story and a vision for global change. There are frequent opportunities to get to know the other scholars, whether it is the weekly gatherings for tea, the monthly Meet and Mingle nights or the ad hoc pub crawl or touch rugby match. This week at tea, my conversations ranged from the ideal flour for baking bread and research on using beta-blockers to inhibit memory retention in PTSD victims, to perceptions of female education in rural Pakistan and comical mishaps during block-starts at swim meets. 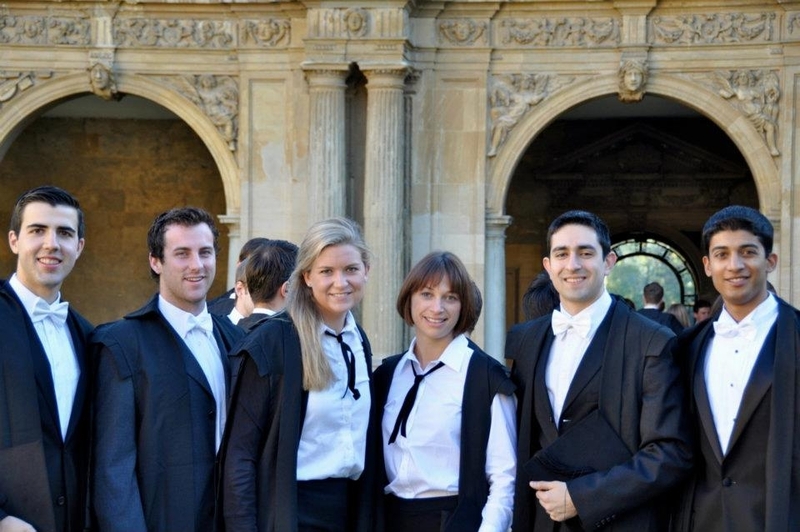 I can’t imagine a better depiction of what Rhodes scholars are like and am increasingly convinced that these small exchanges, more so than any curriculum or grand adventures, will prove to be the most cherished element of the Oxford experience. 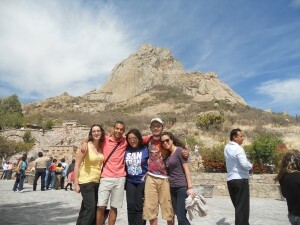 Last post: Nine months is not enough to truly enjoy all that Mexico, or any other country, has to offer. One of the greatest aspects of the Fulbright ETA is that your schedule mirrors your students’ schedule so you get a lot of free time to explore your interests and travel. From seeing the air in Michoacan thick with thousands of migrating butterflies to splashing with the locals at the breathtaking clear blue waters at Agua Azul, I discovered that there is so much more to Mexico than the stereotypical tourist destinations. Reports on the dangers of Mexico have been greatly exaggerated as well. There are only a few states that I would not go to, and my local friends were very helpful in telling us which ones to avoid. Teaching adults who were teachers was intimidating, but I grew to love it. Working with teachers meant we could have mature discussions about serious topics and shared a passion for pedagogy. I even learned some teaching tips from my students! I also learned a lot about teaching, time management and how to handle unexpected situations. In my spare time, I went around to local high schools and colleges and guest taught to gain more experience working with different age groups. We are so blessed in the United States to have such small classrooms for K-12. Most of the classrooms I saw had up to 60 students in one class, which made both learning and teaching more difficult! 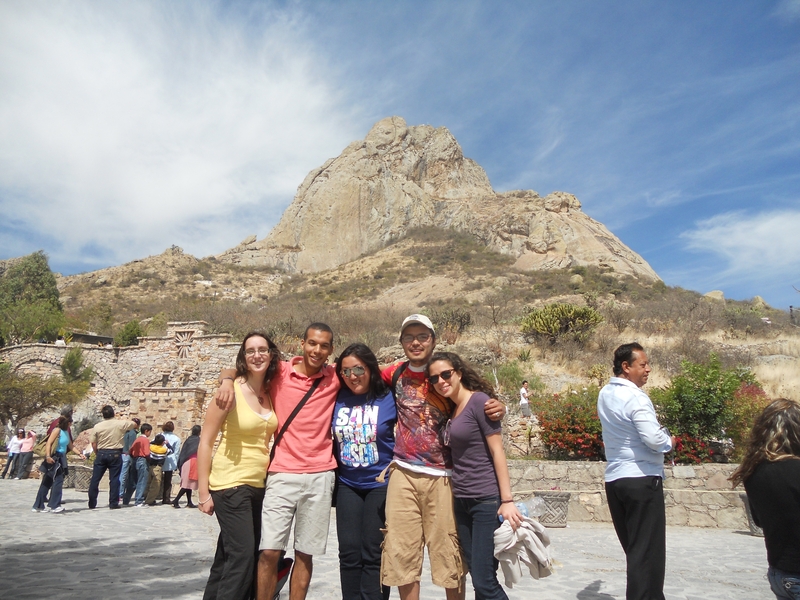 One of my proudest achievements was climbing the third highest monolith in the world, the Peña de Bernal. I am not a very experienced hiker and it was one of the most difficult things I have ever done. I was also proud of the inaugural multicultural exposition I created and implemented at my school. Students from all levels of English classes researched and presented on American, British and Mexican culture. Researching different aspects of the different cultures helped students break stereotypes and compare similarities between cultures. 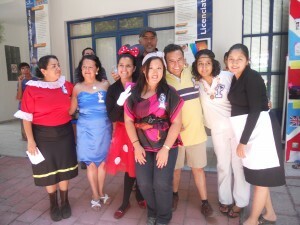 Some of my students and I decided to dress up as American pop culture characters. It was hilarious seeing Charlie Brown and Minnie Mouse talk about eating burgers and pizza. The exposition was so well received that the school plans to make it an annual event. I miss Mexico very much, from its delicious but potentially dangerous street food to its passive-aggressive no-parking signs (“We’ll puncture your tire for free!”). No matter what program you choose or where you decide to apply, you will have an invaluable and unforgettable experience. If you are interested in learning more about a different culture or country and love learning, research, teaching, business or music, the Fulbright will be perfect for you. The application process and competition can seem daunting but the knowledgeable staff at SOP will help you every step of the way. Their careful editing and suggestions and personalized advising will help you create the strongest application possible for you to win the Fulbright and beyond! Hello! My name is Liane; I graduated from UCI in 2011 with a bachelor’s degree in French and I’m in France through the TAPIF (Teaching Assistant Program in France). This means that the French Government hired me to be an English Teaching Assistant for 7 months and is paying me a living wage to work 12 hours a week (and enjoy living in France…). Oh – and did I mention that here in France every 6 or 7 weeks the schools have 2 weeks of vacation? I’ve been here for about two-and-a-half months now and have been having a great time. Besides teaching, I’ve gotten to travel in Belgium for a week, do Paris and visit Heidelberg in Germany (not to mention a few little day trips to places in France and in Germany!). Oh, and this weekend I’m going to visit Luxembourg! I was placed in Freyming-Merlebach. Where is that – you ask? Why, that’s due east of Paris, past Metz, and smack dab on the German border. It’s a little town with a population of 14,000 or so. It is a great location to visit a number of different countries! I work 8 hours a week in a Vocational High School and 4 hours a week in a Middle School. The two schools are very different from one another and so are my jobs in each one. At the high school, I’m working with the “less academically inclined” set of students. These are all students that aren’t bound for the university and will, instead, be going straight into the real world as chefs, waiters, salespeople, or will work in childcare or with the elderly. Here I mostly do what the teachers ask me; normally, I do a lesson here and there about American culture or a presentation to model how the students should do one, but mostly, I try to help prepare the students for their oral exams they will have to pass to graduate and get a job. At the middle school, the students understand just as much as the high school students (and sometimes even better!). I have very little guidance in this school and get to choose any topic I want. And, I also have the freedom and autonomy to choose if I want to work with the whole class at a time, or work with half the class first and then switch. I’ve done the basics on Halloween and Thanksgiving, but also lessons on Dr. Seuss and football! The students are really eager to learn and it is a lot of fun. I’m one of the lucky assistants, in that my post offers me free board. I live in the school “dorm” which houses about 40 of the high school students during the week. During the weekend, everyone goes home and the building is empty. I’m allowed to stay, but I always go home with one of the teachers if I’m not doing a little traveling. I’m a bit isolated, but the teachers I work with do a lot to compensate by helping me get to the train station and making sure I have everything I need. Overall, I’m having a good time and this is an amazing opportunity for anyone who wants to teach or just work in France. For anyone who is interested, you don’t need to know a lot of French – sometimes it’s better to not know too much French because then you won’t be tempted to use it in class, which is a bit of a challenge for me. If you want to know more details about my time here, check out my blog (http://suivrelapiste.blogspot.com/). You are currently browsing the Scholarship Opportunities Program blog archives for December, 2011.